Helps repair and strengthen the bones and cartilage surrounding your joints. HOW CAN Super Joint Support ® HELP? 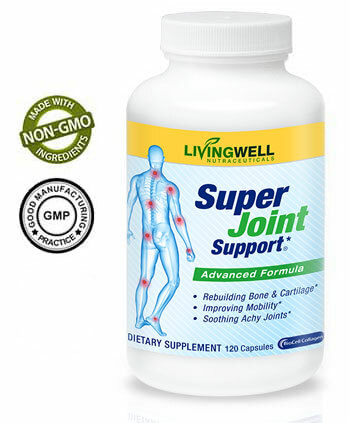 Super Joint Support® is the strongest, most powerful and comprehensive joint support you’ll find today. Our advanced formula does what all other formulas fail to do — it gives you the bone-building nutrients your body craves to support strong and healthy bones. 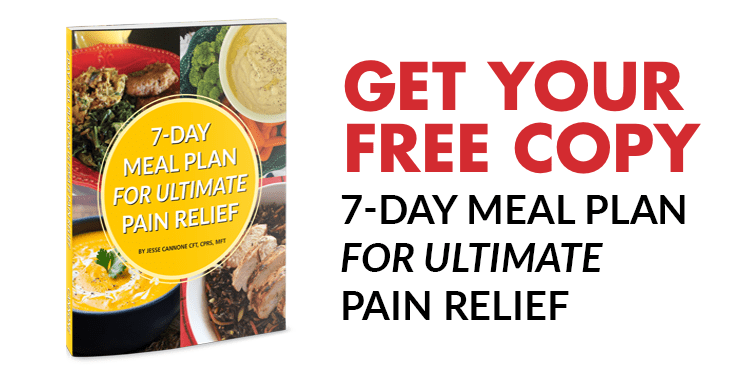 Essential Step #1: Our Super Joint Support® proprietary formula goes straight to the source of your annoying discomfort and reduces irritation. It doesn't mask it — it snuffs it out. Essential Step #2: Super Joint Support’s® exclusive formula of vitamins, nutraceuticals and 72 Ionic Sea Minerals supports healthy cartilage. It’s far more effective than glucosamine and chondroitin alone (Studies show that 90% of collagen is absorbed within 6 hours.) It’s almost as if you’re putting super-absorbent “pillows” inside your knees, ankles, hips and elbows! Essential Step #3: It actually supports biological processes that rebuild and strengthen your bones. Yes, you read that correctly. I’m saying it PROMOTES REMOVAL OF OLD BONE that has been damaged by years of joints grinding together and from disintegrating cartilage. For healthy teeth and bones! Also helps regulate nerve function. Supports collagen synthesis and vitamin D metabolism. To boost white blood cell production in your immune system! Essential for potential of an enzyme responsible for the formation of strong, lexible connective tissue and bone formation. 7 Also aids in the absorption of iron. 1Clin Kidney J. 2012 Feb; 5(Suppl 1): i3–i14. 2Clin Colon Rectal Surg. 2012 Mar; 25(1): 12–19. 3Clin Cases Miner Bone Metab. 2016 Sep-Dec; 13(3): 181–185. 4Clin Cases Miner Bone Metab. 2016 Sep-Dec; 13(3): 181–185. 8Clin Cases Miner Bone Metab. 2016 Sep-Dec; 13(3): 181–185. This product contains Shellfish, do not take if you are allergic to shellfish. Caution: Persons who suffer from medical conditions or who are taking medications (including Blood Thinners including Aspirin) should consult their physician prior to taking this product. Caution: If you have a sensitivity to aspirin including but not limited to (Asthma, Ulcers, Hemophilia, or Kidney or Liver Disease) should consult their physician prior to taking this product. Vitamin K Precautions: One study suggests that intake of Vitamin K under 250mcg allowed users of Warfarin to stay at their 4.4mg dose, however, once the Vitamin K intake exceeded 250mcg the Warfarin had to be increased to 5.8mg. The study goes on to say that Warfarin dosage will vary be between individuals and users must be monitored closely, once a Vitamin K dose has been established, it is best to stick with that Vitamin K dose so that there are minimal variations in the daily intake... Again, it's not that you can not take Super Joint Support with 45mcg of Vitamin K but you have to work with your physician to make sure your blood levels are balanced and in the save range for you... https://www.cc.nih.gov/ccc/patient_education/drug_nutrient/coumadin1.pdf If you have question or concerns about you taking Super Joint Support while on a blood thinner, like Warfarin... 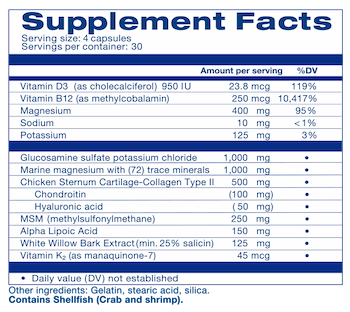 Please ask your Physician this simple question... "Is there any reason why I can not take Super Joint Support, that has 45mcg of Vitamin K in it?" To be honest, you don’t. Not for sure. Everyone’s body is different and what works for one person may not work for another. We have formulated Super Joint Support™ with the best and most effective combination of nutrients to support your joints in 3 ways. First, to relieve pain quickly. Second, to regrow the soft cartilage that gently cushions your joints. But Super Joint Support™ goes one step further. We’ve added nutrients to our formula to help strengthen and rebuild your bones. No other joint support formula does all three. It’s like getting three joint support products in one. But the only way to know for sure if it’ll work for you is to try it. If it’s not the best joint support formula you’ve ever tried, simply return the empty bottles or unused portion and we’ll send you a full refund (excluding shipping and handling). Not at all! It's never too late to support your body and joints. The suggested daily dose of Super Joint Support™ is 4 capsules per day. Take 2 capsules in the morning with breakfast and 2 capsules in the evening with dinner. Loading Dose: If your body weight is over 150lbs and your symptoms are severe, at anytime during the use of this product you may take an additional 2 capsules daily for as long as you need. In this case, take 1 additional capsule with your morning dose and 1 additional capsule with your evening dose. (with meals) Note: While there are no stimulants in Super Joint Support™, the ionic minerals are very energetic. If you feel like this product energizes you, you may consider taking the second dose of Super Joint Support™ at lunchtime, to ensure no disruption in your sleep patterns. That said, please take the two doses at least 6 hours apart. Each bottle of Super Joint Support contains 120 capsules. Each bottle contains a one month (30 day) supply at the suggested dose of 4 capsules per day. Super Joint Support was formulated to be taken daily and tolerated well with long term use. Some individuals will find comfort very quickly while the result for others will depend on the severity of one's own condition. We suggest taking Super Joint Support daily while symptoms are present to maintain optimal joint function. Yes. In fact, it is the most important aspect of taking any supplement. We suggest that you take Super Joint Support with 8 oz of water and then 15 minutes later, drink an additional 8oz of water. This ensures the nutrients are in solution and are flushed into your small intestine for optimal absorption. No without consulting your physician first, the HBI will never suggest or support anyone, changing how or what is taken, that is only able to come from your physician. Individuals taking any medication should consult a physician prior to taking Super Joint Support. Even if you do get clearance to take Super Joint Support, while on your other medications it is recommended that you wait or give at least 60 minutes, in between taking either one of them, in other words, if you take any medication, please wait 60 minutes before taking the Super Joint Support and visa versa. Yes, we recommend you take Super Joint Support with food. Yes! There are no known contraindications between Super Joint Support and any other supplement. No, Super Joint Support is only offered by the Healthy Back Institute® and its affiliates. We can not suggest or support the use of Super Joint Support if the expiration date on the bottle has passed. If you choose to take the product past the expiration date you do so at your own risk. We guarantee you’ll love Super Joint Support or we’ll refund your money. 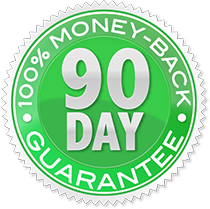 If you’re not happy for any reason, simply return Super Joint Support within 90 days of your purchase date for a full refund, less shipping. No questions asked. Which is why we recommend you find your own personal “RIGHT” dosage of Super Joint Support that’s unique to you. By taking more, you give your body a much better chance of clearing away DECADES of sticky buildup of scar tissue that keeps you in pain. And you never have to worry about taking too much. Super Joint Support is safe and non-addictive.